Polish Amber, Sterling Silver, Southewstern and Native American Indian Jewelry, Mesa, AZ. 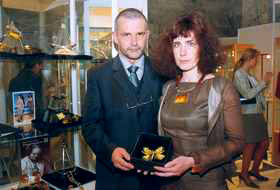 O Danuta and Mariusz Gliwin'scy have been producing the artistic jewellery with amber since the end of the seventies. Thanks to a big sensitivity and intensive work they've created their own style of the silver jewellery, manually forming settings for the fine kinds of amber. Big, shiny, carefully made silver surfaces are designed to emphasise the natural beauty of the stones. Especially attractive are the sets of jewellery consisting of many elements (necklaces, rings, bracelets, buckles, brooches) connected by the common composition rule. O The Gliwin'scy's eagerly use several surprisingly matched materials like, for example, steel, leather, silk and others to decorate the amber. In their compositions, the modernity often joins nearly all ethnic traditions. Since all their works are hand made, they keep this unique character. The Gliwin'scy's constantly take part in exhibitions, competitions, and fashion shows in Poland and abroad. They are often rewarded for their originality of design and perfect quality. Their works are displayed in the Earth Museum in Warsaw and the Archaeological Museum in Gdan'sk.